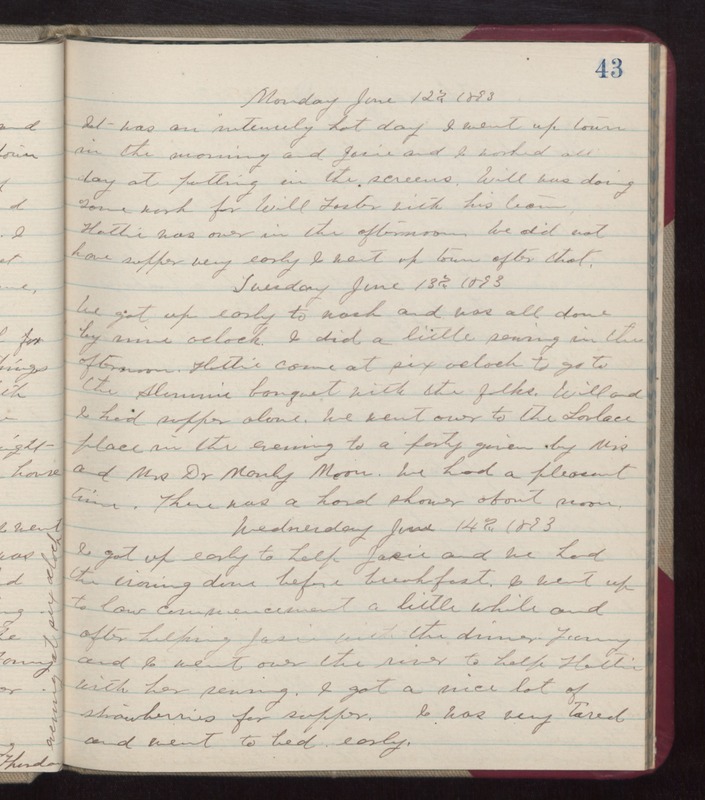 Monday June 12th 1893 It was an intensely hot day. I went up town in the morning and Josie and I worked all day at putting in the screens. Will was doing some work for Will Foster with his team. Hattie was over in the afternoon. We did not have supper very early. I went up town after that. Tuesday June 13th 1893 We got up early to wash and was all done by nine oclock. I did a little sewing in the afternoon. Hattie came at six oclock to go to the Alumni banquet with the folks. Will and II had supper alone. We went over to the Lovlace place in the evening to a party given by Miss and Mrs Dr Manly Moon. We had a pleasant time. There was a hard shower about noon. Wednesday June 14th 1893 I got up early to help Josie and we had the ironing done before breakfast. I went up to law commencement a little while and after helping Josie with the dinner Fanny and I went over the river to help Hattie with her sewing. I got a nice lot of strawberries for supper. I was very tired and went to bed early.